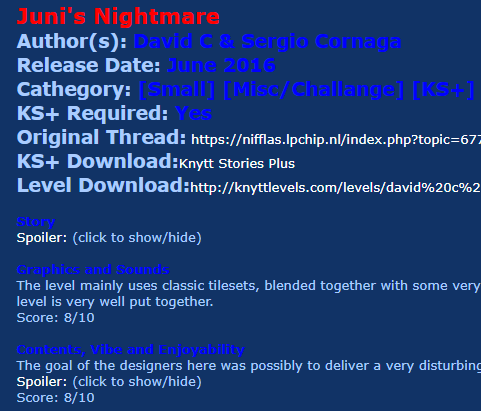 Miragent's Reviews: Review Criteria and Review 00: "Juni's Nightmare"
As announced on Discord, I plan to write some reviews. - Levels with a low final score might not be discussed in depht and will possibly have no subgrades. Levels that are very bad or simply meaningless will not receive any review. If I ever get to talk about them, I will just state to avoid them. Quality and choice of tilesets, gradients, music and ambience and how well these blend together are reviewed here. The quality of the level design, as well as flags and warps, and possible issues like unintended wallswims, sequence breaking, bad English, presence of reachable void screens or clumsy level building in general is discussed. Score: 0 to 10, where 6 is the "passable" threshold. Here I shall describe how the level will try to make you feel and how well it accompleshes doing so. Some levels are plain boring, with uninteresting and quickly put together contents, others will be coherent, enjoyable works and make you laugh out loud ,or intentionally disturb you, or bring out other emotions. This section reviews the quality of this attempt. This section will cover the quantity, quality and describe the nature of the secrets bonus material. Everything will be strictly inside spoiler brackets. Please note that in some cases, the level simply does not have secrets at all, or the bonus material is so scarce it cannot be reviewed. Levels do not strictly require to feature bonus material to excel, even if, in most cases, secrets are welcome, especially when they are well orchestrated. Secrets that are present but uninteresting, too easy to reach, virtually impossible to reach or in general not rewarding will get a lower score. Levels with zero or near-zero bonus material will not score 0/10; I will just state there is not enough bonus material to review. Please note, however, that in these situations, if I feel that the absence of secrets impacts negatively on the quality of the level, the "Contents, Vibe and Enjoyability" score will be affected. Here I will state the difficulty of the level. In most cases I will also spend a few words. "Any % Exploration" and "Any % Challanges" will rate the difficulty to merely get to the easiest proper ending of the level. It can be a somewhat bad ending, but it has to be the proper way the level is supposed to end when you have not found all (or any) of the secrets (if present). So it cannot be an "easter egg ending". "Any 100% Exploration" and "Any 100% Challanges" will rate the difficulty in the case you want to get every bonus item, see every alternate ending no matter if they are good or bad, every easter egg ending, when any of these bonus contents are present. If the Level has no bonus material, The Accessibility section will just be broken into "Exploration" and "Challanges". Note: when a level requires for example "up to medium" difficulty skills, and only has one or a very few "spikes" where the difficulty would be "very hard", I shall not describe the difficulty as "up to very hard" because it would not describe the general feeling of the level. In this case I will rate it "2/5 with a few 4/5 spikes". I will sum up the pros and cons and judge my overall experience. For your information, I have good, but not exceptional KS skills. So I will attempt what I consider "very hard" difficulty challanges about 10-20 times, then I will use cheats if I can't get through. "Lunatic" challanges will be skipped to get to see the whole level. I will do my best and spend what I consider a sufficient amount of time to look for all the secrets one level has to offer, legitimately, after which, if I have not found everything, I will start cheating, which includes looking at the editor, going out of bounds and all similar tricks, in order to get to see the whole level. If one level has multiple endings and the author does not offer a warp to "go back to look for the other endings", I will generally go through the whole level legitimately again only if the different ending and the contents to reach it look interesting enough. If they are not, I will just get an idea of what it looks like in the file folder. In Juni's Nightmare, she is trapped inside a terrible nightmare she is having, and your objective is not openly given, but appears to be to wake her up. The level mainly uses classic tilesets, blended together with some very nice custom music. While using a limited number of custom objects, they are put to use well, and overall, the level is solid. The level can be played for a couple of minutes, but you will get the "bad ending". Supposedly, at this point the adventure finishes because Juni wakes up, and this is what will happen to the vast majority of the players. But the real challange is to get the alternate ending, in which Juni appears to wake up more peacefully. The alternate, better ending is hidden inside the level more deeply than one can probably imagine. To find it you need to go through intended wallswims, pixel perfect jumps, difficult umbrella airstream puzzles and a nearly impossible laser challange where you will most likely resort to cheating. One of the NPCs inside the dream suggests you to search on google to find how to cheat if you don't know how. One hint is inside the info.png file inside the level folder. Exceptionally clever, but easily overlooked. Long story short, only a small portion of players will get to see the alternate ending and fully enjoy the level. This impacts negatively on the overall experience, even when the authors wanted the level to be just like this. The Hologram Generator appars to have no use and is impossible to reach legitimately anyway. This was my first review. Please let me know if you enjoyed it and what you think about it. Also please let me know if there is something you would absolutely remove or add to my format. I can say I like it as it is but I will definitely listen to other people's suggestions. Thank you stars to LPChip, StraightFlame and Fubaka for the help. -Tried LPChip's c=1 c=2 c=3 c=4 bbcodes and I must say the colors look really nice. However, adding bold to the titles makes me read the review more easily (I agree with StraightFlame on this), so after trying both ways I have chosen the bold titles. I feel like I have reached a state where I can be happy with the format and if I make any more changes I will take this format as a base. Thank you to all who contribued! This is a pretty nice format. I especially like how the difficulty of the mandatory and optional stuff get separate ratings. Edit: Also, apparently if you nest color and bold tags like [color][b]this[/b][/color], the colors don't show up in the FiNCK theme. I've told LPChip about this in the Discord and he says he doesn't think he can fix it. I don't know how many people use the FiNCK theme, but i feel like you might want to stick to [b][color]this[/color][/b] instead regardless. Nice details you got here, micht. I should point out that you misspelled 'category' as 'cathegory', so ye should fix that. If I were you, I'd try to dig up some more obscure old gems to review. There're a lot of levels in the backlog that have very little exposure, as they were only ever released to knyttlevels.com and never publicly announced on the forums. You should be able to find one you like without too much trouble. Reaction to StraightFlame's edit: Or use only one of the two. We do have a rule to avoid excessive bbcode when its not necessary, and in this case its not necessary to have both. The same point will be made if its not bold or if color is not used. Thank you everyone for reading and for the suggestions. @LPChip Ok. Thank you for moving the post in the right section. I will use the bbcode as you have suggested from now on. Really sorry, I'm so new at this. Making this post was a struggle but I try to learn quickly as you will see. Can I ask you one thing? how does one properly get to show a picture on the forum here? The simple link offered by deviantart (I'm not even sure if deviantart was the good choice to upload images)enclosed between img bbcode didn't work. So I ended up trying every combination of bbcode nesting with deviantart and google offered links and one combination ended up showning an image. But I don't know how it's done properly. Please pm me how this is done, I am a total newbie at this but I try my best and I'm sure it's not difficult. @Fubaka: I'm glad you liked the review. Ok. Category typo corrected. You really are good at spotting details. If I ever make a level you would be my dream beta tester. I definitely look forward to find hidden interesting levels. I don't expect to find masterpieces, but I am 99% sure I will find interesting levels that never had public presentation. All this is so excitong! @StraightFlame: I'm glad you liked the review. Huh...Listen. I... don't know what all these Within a deep forest, Knytt, FiNCK and those cr co cg cb things are. So I don't how to use them. I...would just want to write things that don't hurt the eyes and I'm sorry they have hurt someone's eye. Can you please reply or pm with how you think the review would possibly look better? I will copy-paste your version, compare it with mine and look at the differences. This way I will have a starting point and improve from there. @StraightFlame: Have your eyes recovered? Kidding. But how does the review look now? Does it look better to you now? See, I have used your [cx] tags! It's still blue on blue, of course, but that doesn't really matter to me personally. Thanks for the review! Despite LPChip's claim that only one text styling is needed, I honestly find this a bit harder to parse without the subheadings in bold. Up to you whether you feel like bringing that back though, I can manage without! I've suggested the use of color priorities to Miragent. Basically you do , , and . 1 is text that is most important, vs 4 is text least important. This will make text easy to read on any of the themes. Wow. Where have those tags been all my life? Those are some amazing color choices! Tried LPChip's c=1 c=2 c=3 c=4 bbcodes and I must say the colors look really nice. However, adding bold to the titles makes me read the review more easily (I agree with StraightFlame on this), so after trying both versions I have chosen the bold titles.